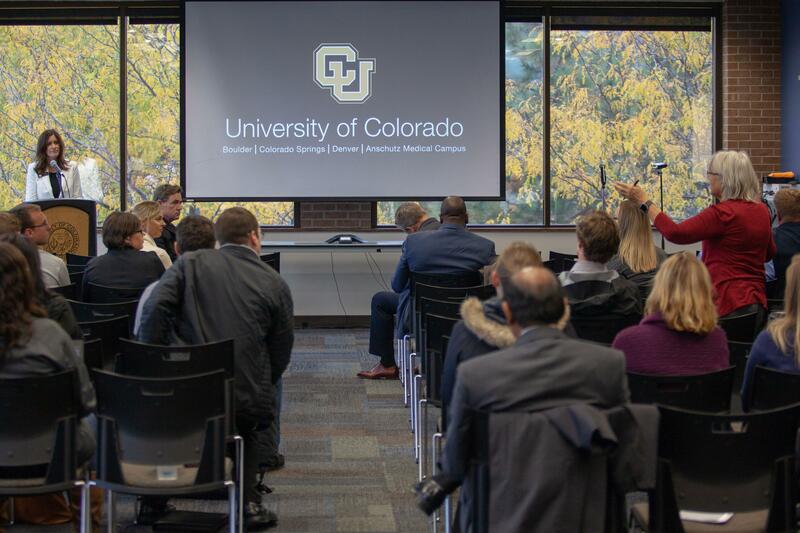 Regent Heidi Ganahl, left, leads a town hall session Oct. 11 on the first stop of a four-campus listening tour for the qualities of the next CU president. Editor’s Note: This story has been updated to reflect a new location for the campus forum. Mark Kennedy, finalist for president of the University of Colorado system, will meet UCCS faculty, staff, students and alumni, along with members of the Colorado Springs community, in an open public forum from 1:30-2:30 p.m. April 23 in University Hall 180. For logistical planning, an RSVP is requested for those attending in person by confirming at rsvp@uccs.edu. Attendees are requested to arrive early and be seated by 1:20 p.m. Two additional shuttles will be available departing Centennial Hall at 12:45 p.m. and 1 p.m. to participants, and will return to central campus at 2:45 p.m. and 3 p.m. A live stream will be available for the forum through YouTube. Questions can be submitted online for both those planning to attend and for those unable to attend. Kennedy will take questions directly from the audience. UCCS is the first campus visit for the presidential finalist during a week of visits to system administration and each of the four campuses. Kennedy will visit the system office April 22, CU Anschutz Medical Campus April 24, CU Denver April 25 and CU Boulder April 26. Kennedy, 61, is president of the University of North Dakota and previously served as a member of the United States House of Representatives (Minnesota) from 2001-07. Before Congress, he had a successful business career in leadership positions with some of America’s leading companies, including those that became Macy’s and General Mills. His academic career before UND includes teaching and research at some of the top universities in the United States and internationally. He also directed the Graduate School of Political Management at George Washington University. His full resume is http://www.cu.edu/finalist-cv, and he published an open letter to the university community at https://www.cu.edu/news/open-letter-university-colorado-community-presidential-finalist-mark-kennedy. Under Colorado law, a finalist for the position must be publicly named for at least two weeks before being named president. Feedback can be submitted at https://www.cu.edu/presidential-search/forms/cu-presidential-search-feedback.